Spanish Writing Genre Tabs for Writing Journals! Five (5) Genres! Trying to find the best way to organize your writing journals? You could organize them by genre! 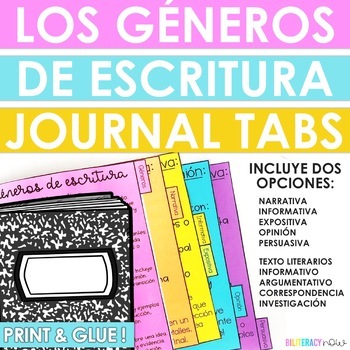 Plus, a summary tab titled "Géneros"
The tabs are a great way to get your students to become familiar with each writing genre and to use as a reference during independent writing time. Want me to include another genre? Email me! ▶You will be able to use these tabs year after year! ▶Unlimited access to any future updates. Visit my store, Biliteracy Now, for all your Spanish needs!